I am very excited and honored to have been invited here this month as Guest Designer. Thanks so much for your invitation! 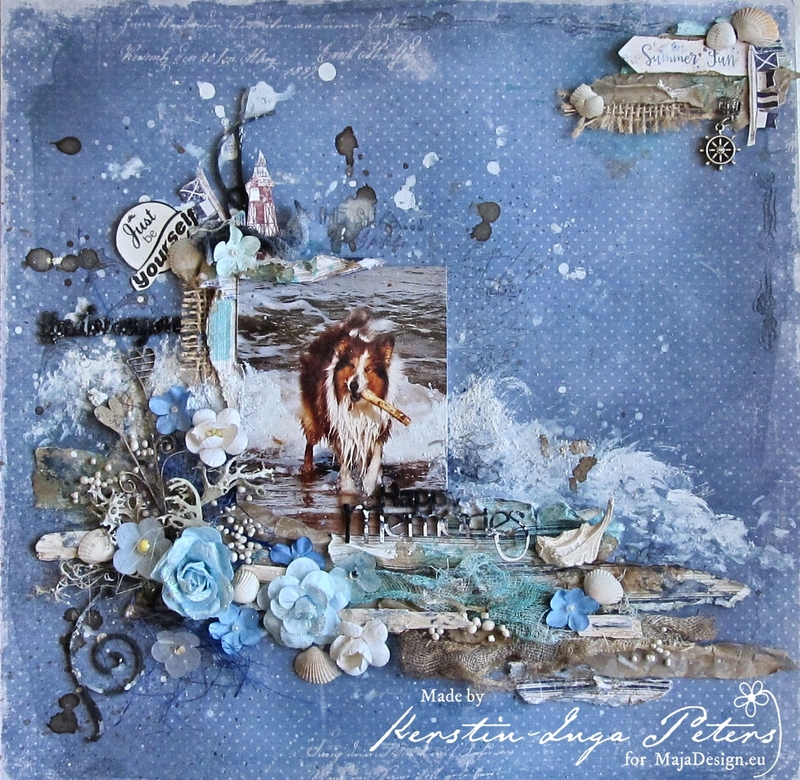 My name is Kerstin- Inga Peters and I come from Germany. I have been creating for many years now, always in search for new techniques and yet unexplored territory in craftland. 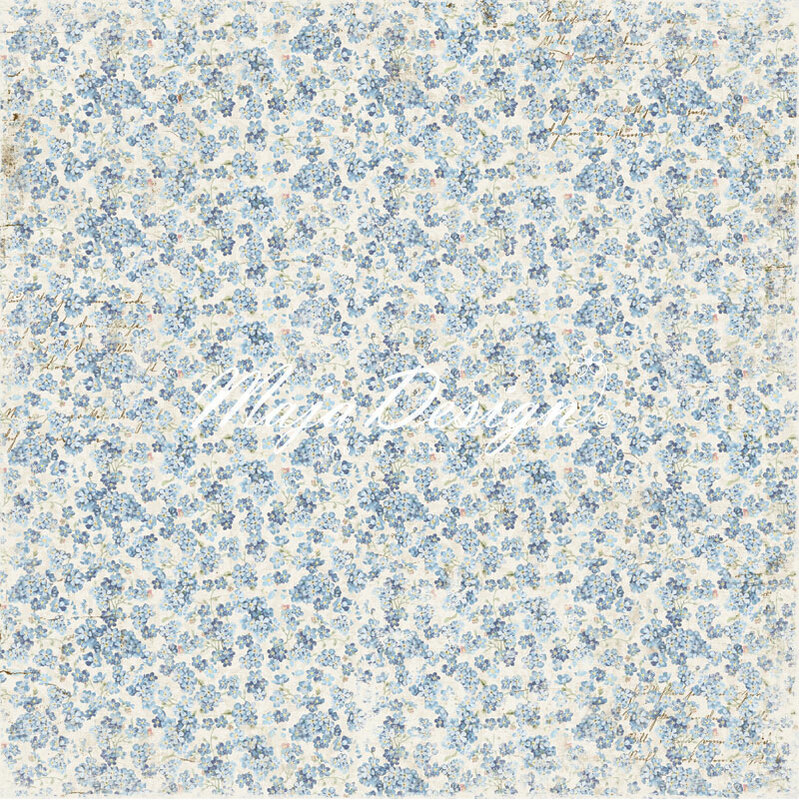 I’m a modern girl with a big vintage heart and my big passion are photos, colours and textures. 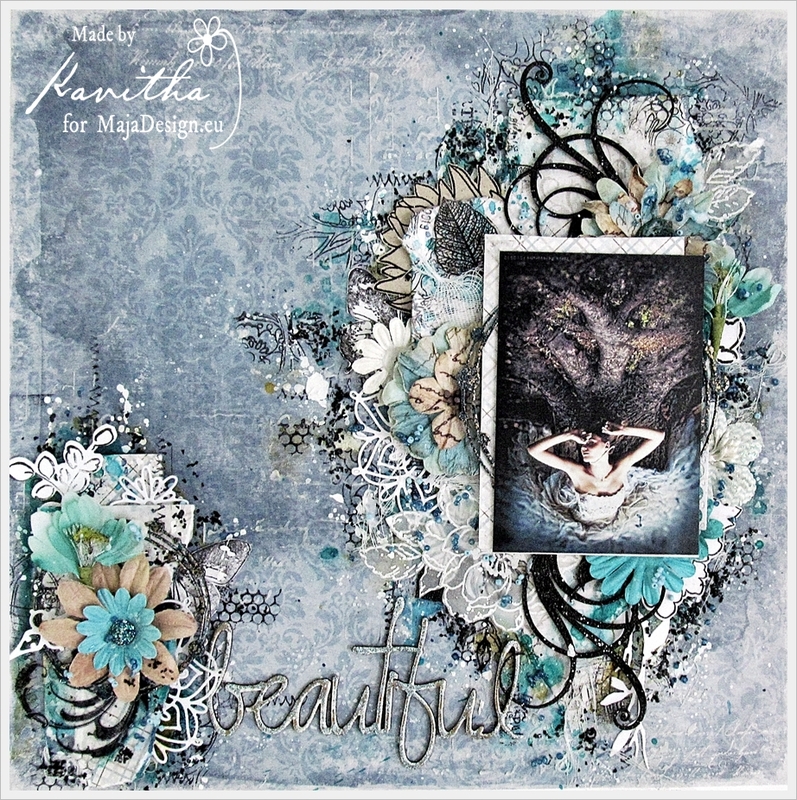 With Scrapbooking and Mixed Media Style I have found ‘my’ perfect favourite genres – as it combines words and pictures, thoughts and feelings, and the application of various innovative products, techniques and the idea of telling stories. I love the sea forever and ever. That’s my place for relaxation, dreaming and inspiration. 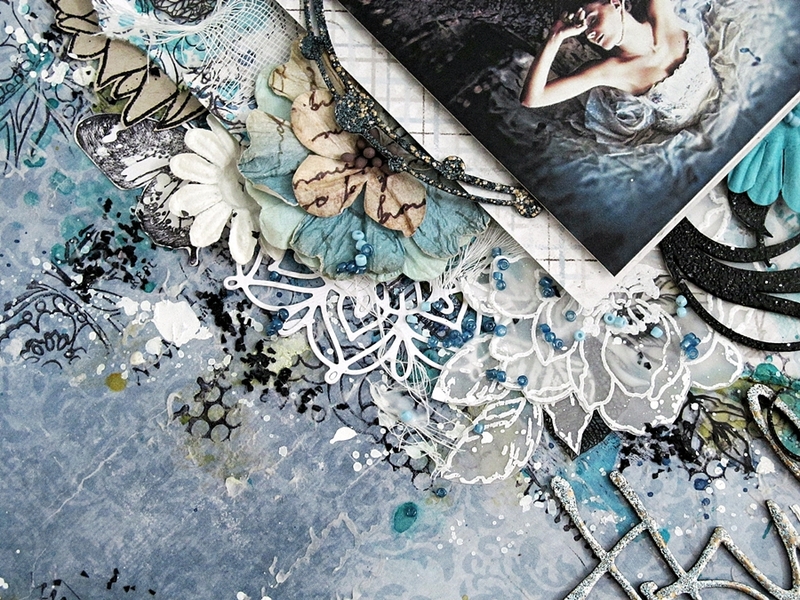 As I saw the wonderful papers I thought, amazing the right colors for sea, beach and so much more. 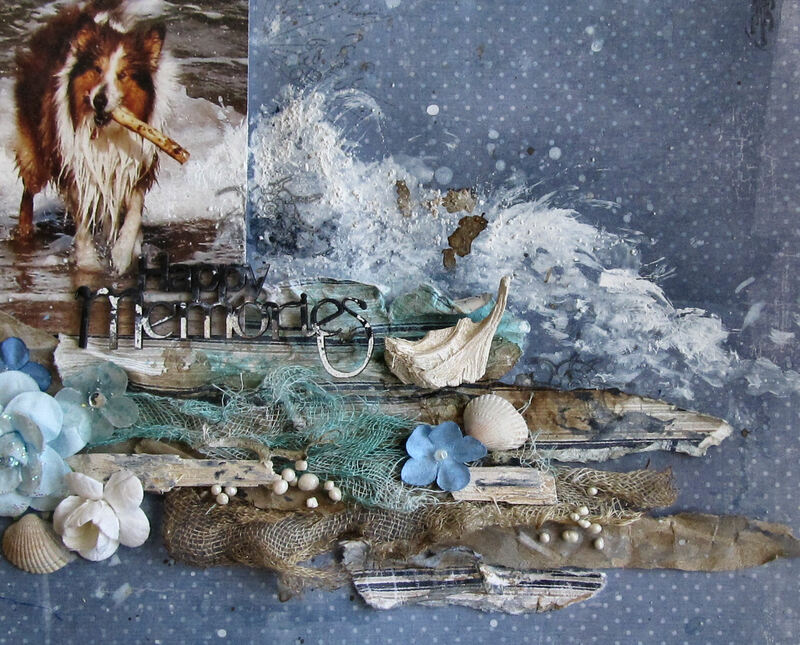 My first layout shows our family sunshine ‘Filou’, it’s a sheltie and he has always so much fun on the sea. His favourite occupation is to get sticks or balls out of the water. 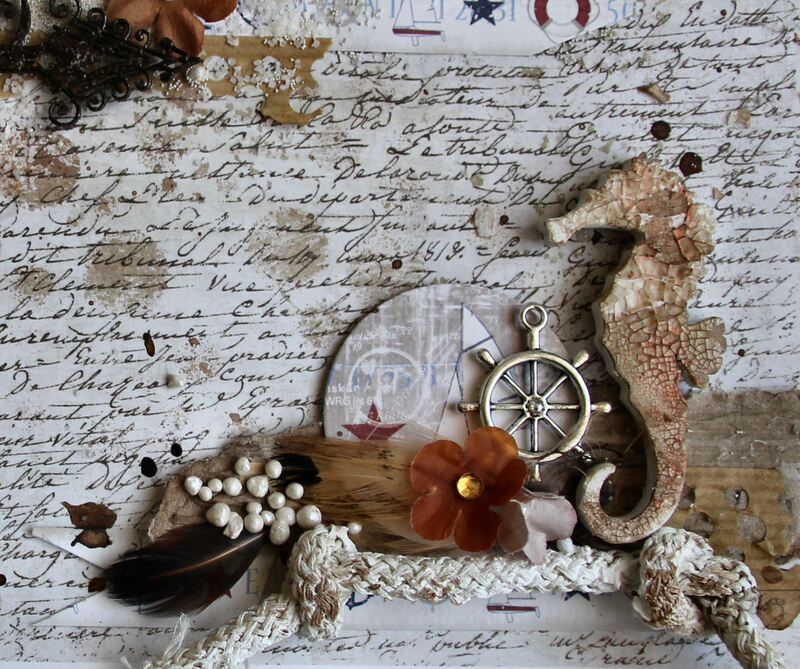 A crumpled craft paper with burlap leftover, some self-collected shells and a piece from edge stripe. 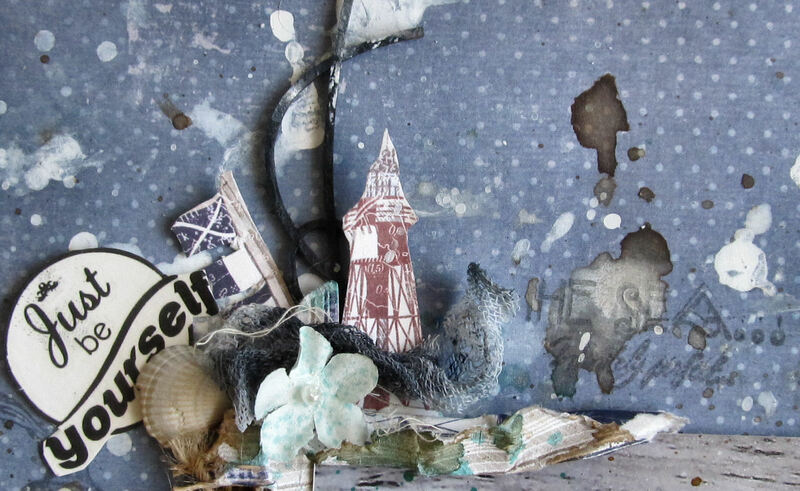 Some stains and splashes with paints diluted with water, together with some cut outs from the ‘Marina’ paper (flags and lighthouse). Can you see the waves on my photo? 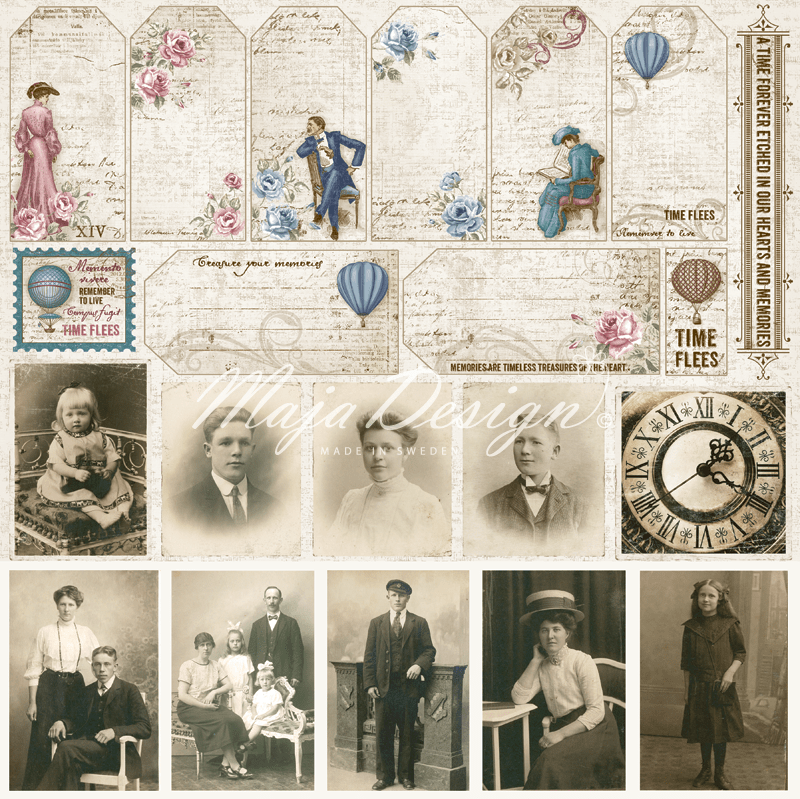 I love the idea to continue some photo elements on the background paper. Here I used a white texture paste and a fan brush for more sea waves. I also used some hand torn stripes together with colored gauze and a lot of little blue flowers. Sunshine, beach, the sea and more: while the little ones dig in the biggest sandpit, the grown-ups lounge in a beach chair enjoying the sun or take a refreshing dip in the sea. traditional ships and museum ships. IT’s really a highlight for me and my vintage soul. So I used here more vintage colors, various brown shades and a wine red. For the wooden seahorse I used a transparent crackle paste in combination with distress ink and a little bit copper wax creme. Some motifs from the ‘Regatta’ were very suitable for my photo and I decided to use a round die to cut out these elements. 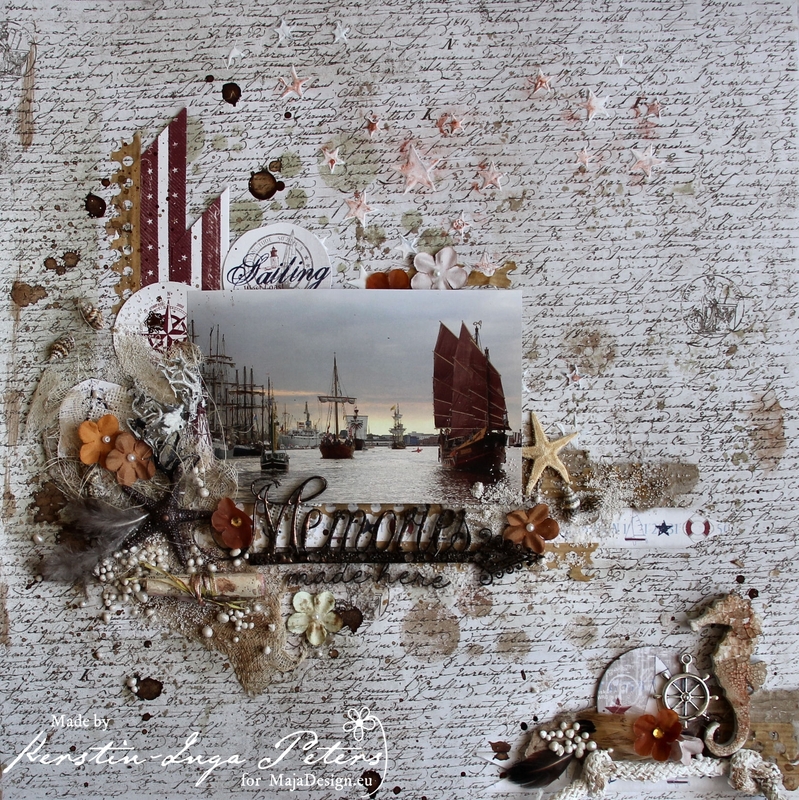 Hello Maja Fans, my name is Julie and I am from Scotland, today I am delighted to be sharing with you a mixed media project and two cards. 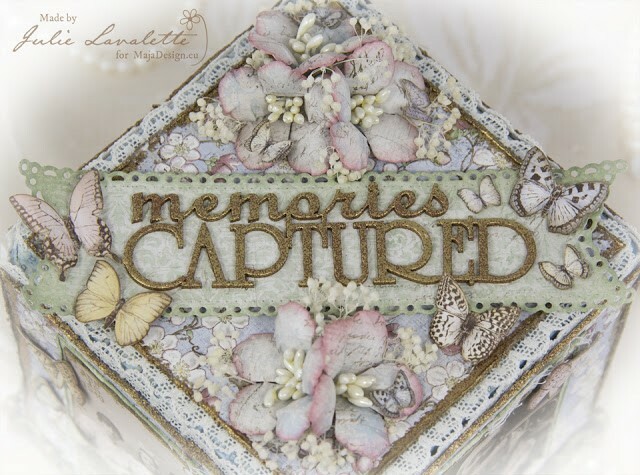 I have been crafting for around ten years now and am at my happiest creating in my craft room watching the birds come into our garden. 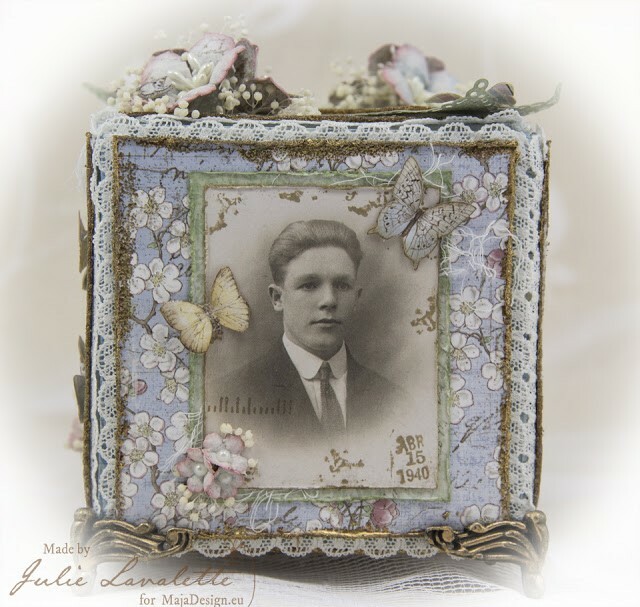 My love for flowers, bygone eras and antiquities I love to express through my creating. 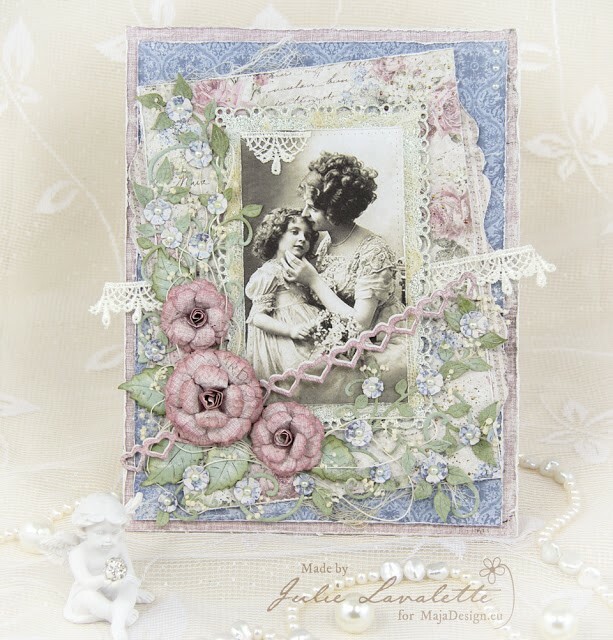 I love bringing a piece of paper to life and creating a story within my card so it becomes a keepsake and has a true meaning for the recipient and I love adding special little touches of details. 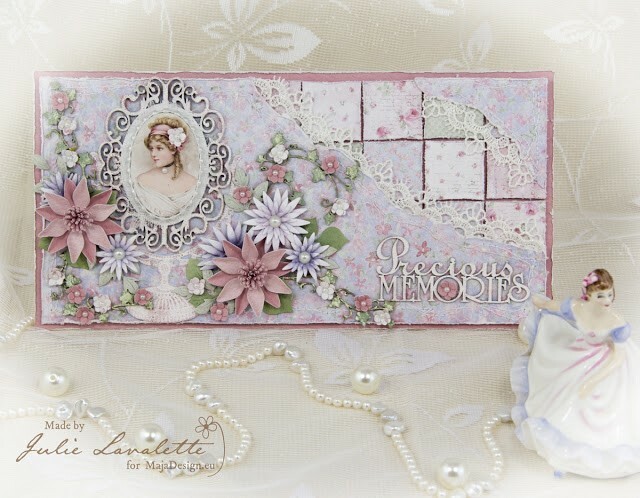 My style is definitely vintage/shabby chic, I love using diecuts and making my own flowers, adding lace, pearls, chipboard and mixed media accents into my designs. So why not grab a cuppa and let me share my projects with you. 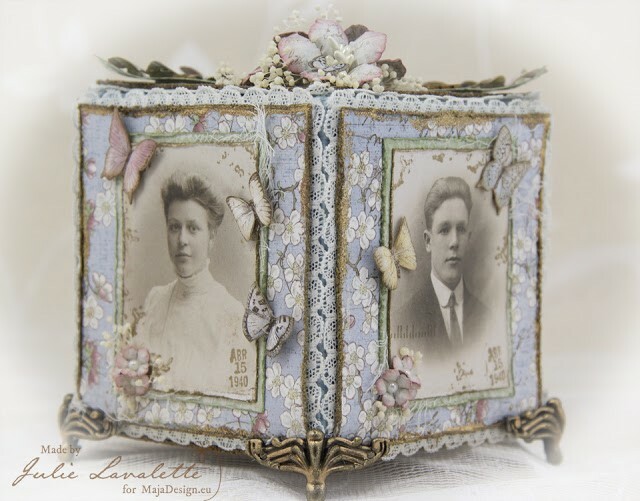 As a child I remember my parents had a Photo Cube in the house where family photos took pride of place and with all the beautiful images Maja Design have to offer I was inspired to making one in a shabby chic style. My cube measures approximately 3.75 inches square and was created by gluing beer mats together to form the cube, adding some coffee stirrer sticks at the joins internally to help strengthen my cube. Next I added tissue tape around all my seams and a little blue Distress paint. My papers were all cut to size and tattered at the edges, I then rubbed some Versamark Ink around the edges and heat embossed my Embossing Powders. I added a pretty lace to the back of my paper and positioned them all in place with foam strips on each side. This helps to give my lace more dimension than lying flush next to the cube. 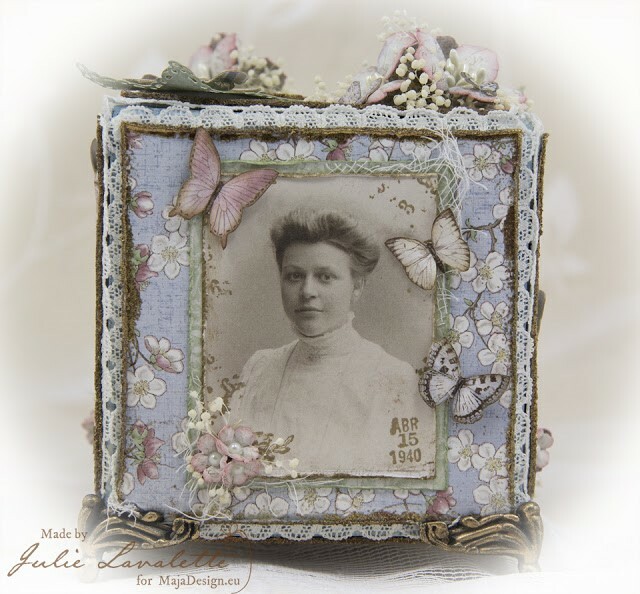 I tattered my images at the edges and added a little stamping to distress them before matting and layering in place on my cube. 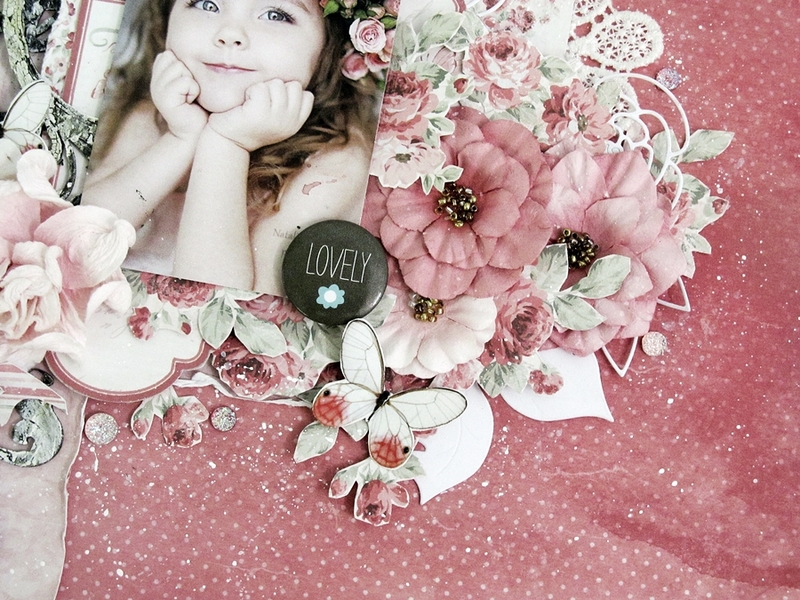 I decorated with lots of small flowers with a Pearl centre and some dried ones. 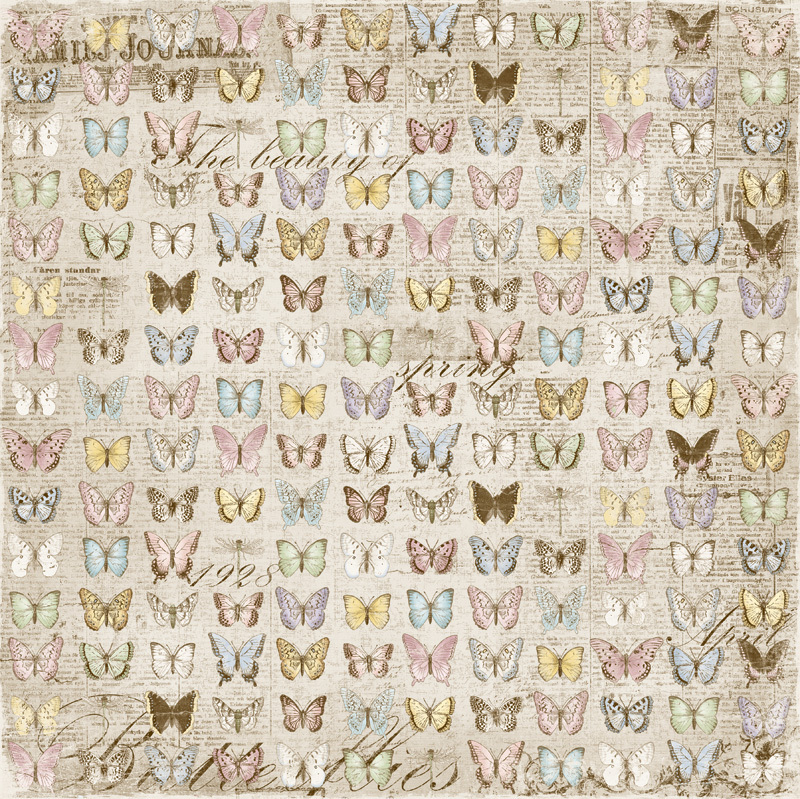 I fussy cut out lots of butterflies using both the 12 x 12 paper and 6 x 6, gosh I adore these butterflies for a perfect finishing touch. 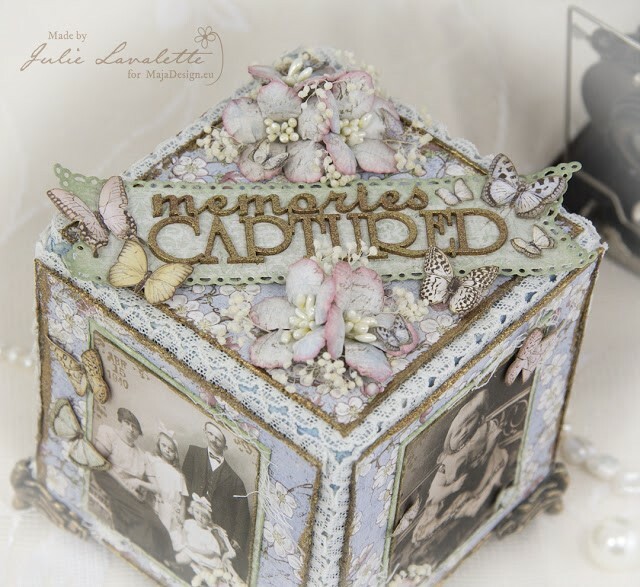 I added a diecut banner onto the top of my cube with my chipboard sentiment which had been heat embossed with the same colours as the edges of my paper. My larger flowers were shaded with Distress Inks and Pearl Stamens added into their centres with some smaller butterflies added onto their petals. 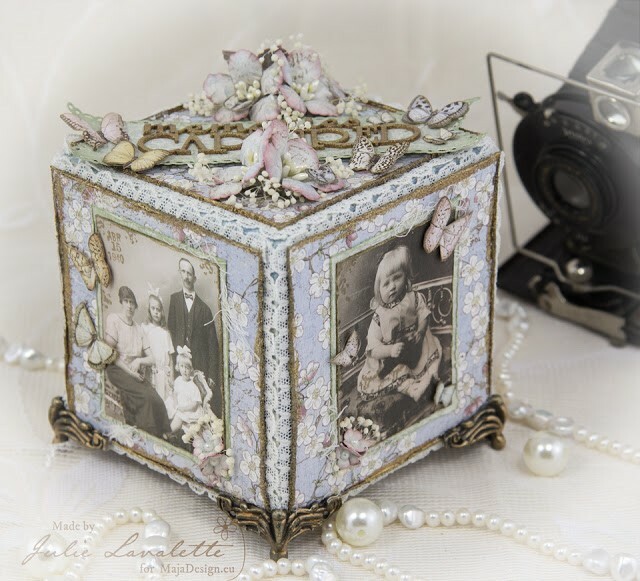 I finished off my cube by adding small brass feet from my stash that I added highlights of Gilding Wax. Finishing of with a few more images of my cube. 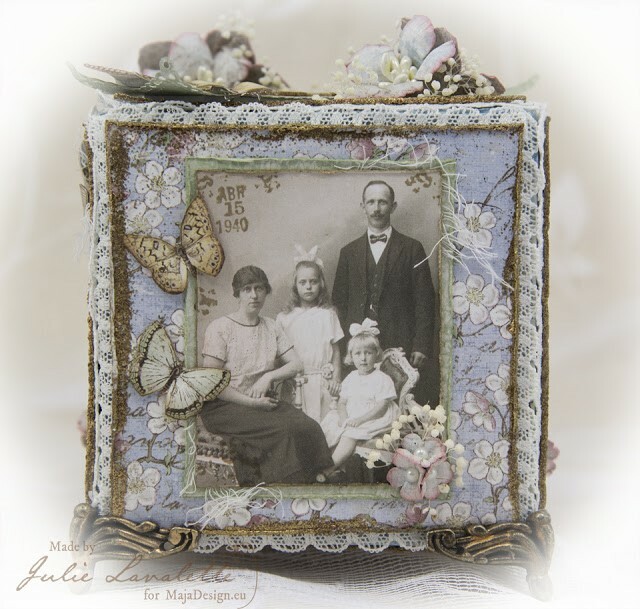 This card uses the exquisite papers from the Sofiero Collection. 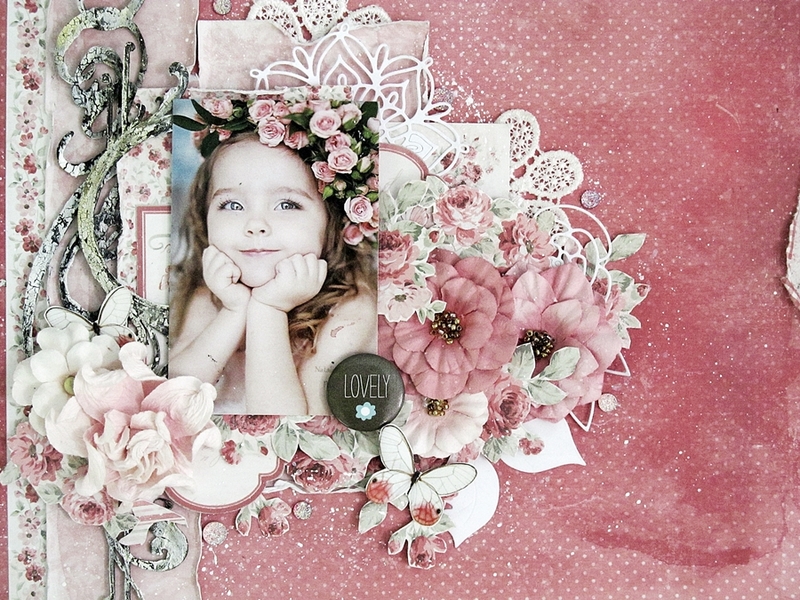 I love the pretty feminine tones and the elegance of the images that compliment any craft project so well. 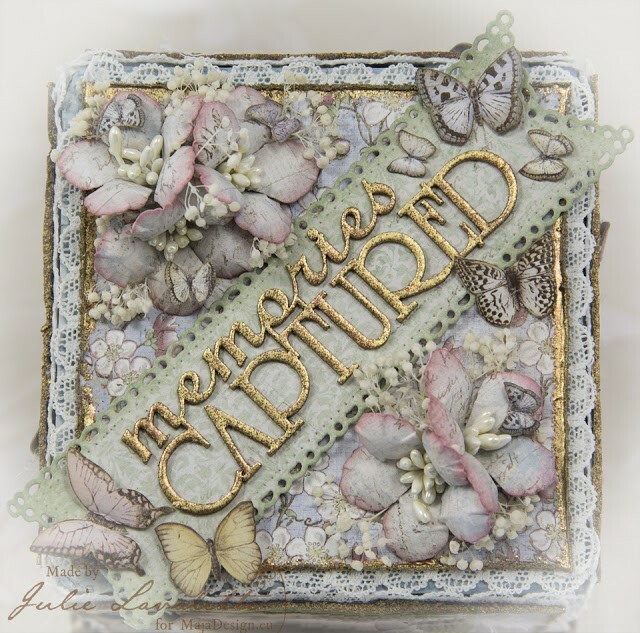 This card measures approximately 5″ x 10″ and I intend to put it into a frame to keep as my ‘Precious Memory’ as a Guest Designer here at Maja Design. I started with tattering the base pink layer of my card with my scissors, this would help frame the soft tones on my design. I gathered lots of little scraps of paper from my Sofiero Collection and cut into approx 1″ squares, tattered at the edges and placed onto my card with foam strips. I now added on my torn layer of paper with tattered edges, some stitching and lace for extra detail. My dressing table mirror was diecut in white cardstock and I stippled on some Gesso for extra texture and once dry I added some Gilding Wax for highlights. You will also notice I replaced the mirror part of my diecut with a oval chipboard which had been painted and gilded in the same way. 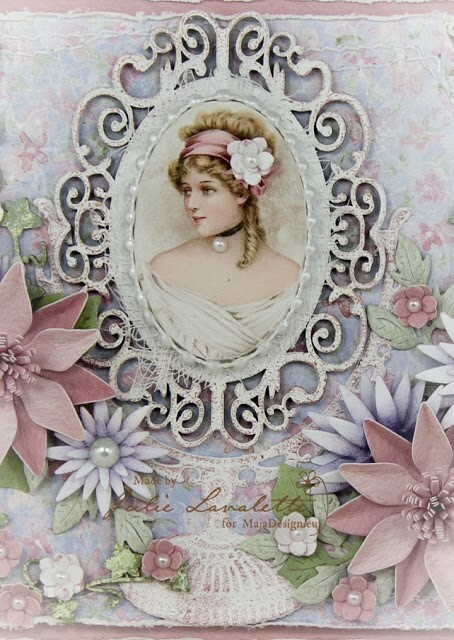 My beautiful image was glued onto an oval chipboard adding Pearls around the frame, finishing with a flower in her hair and a small Pearl added to her choker for extra detail. My Ivy chipboard has been painted nestling some small flowers around them and adding a few diecut leaves. 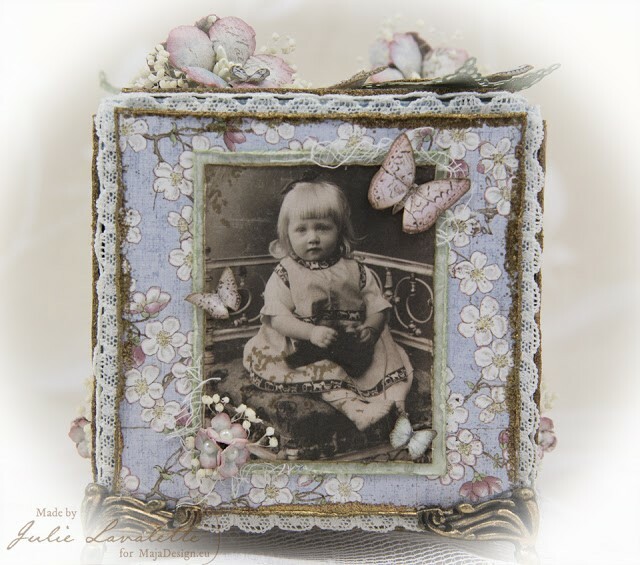 My lilac flowers were created with Distress Inks and adding Pearl centres, my other flowers have all been creating using Maja Papers. 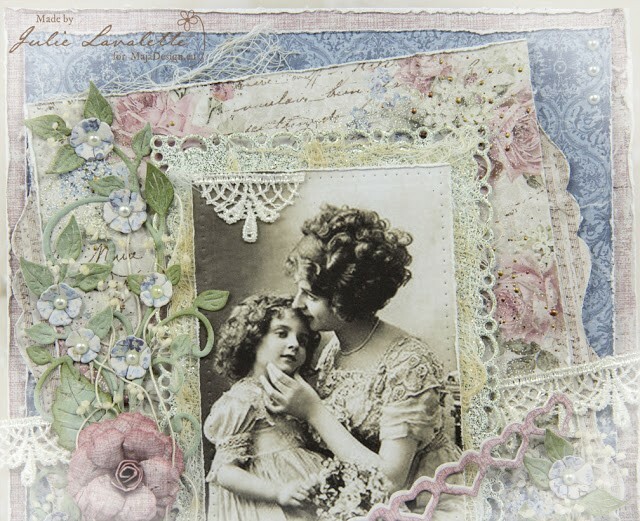 The inspiration for this card which measures 7.5 x 5.5 inches came from the love between a mother and daughter on my image and the beautiful Vintage Romance 12 x 12 paper called Engagement. I knew these would compliment each other so well and I could replicate the pretty flowers from the background paper onto my card. 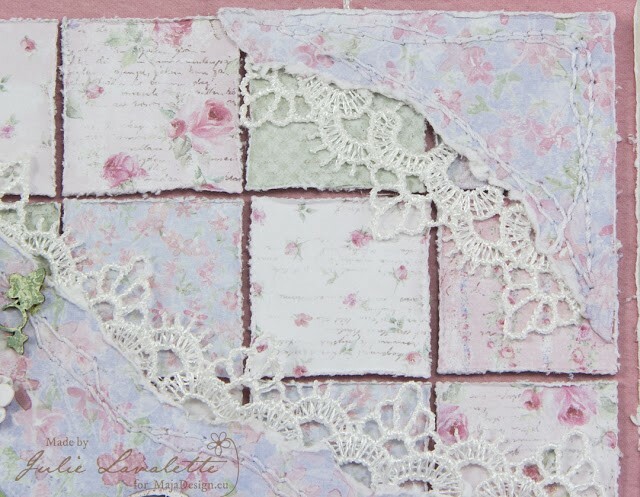 I started by adding tattered layers, accents of cheesecloth, touches of lace and Frantage for a shabby feel. 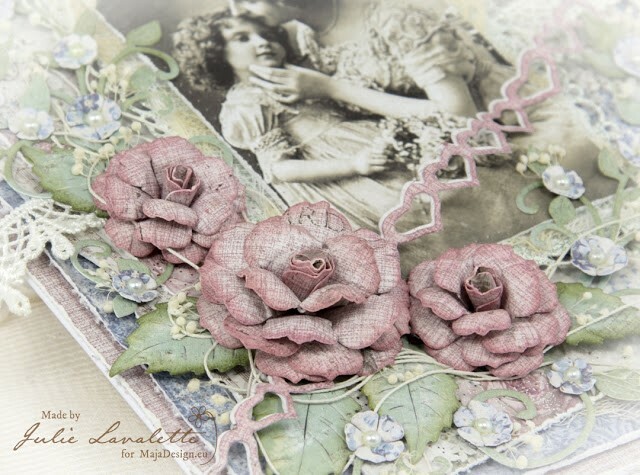 My roses were die cut out in coordinating papers and inked with Victorian Velvet Distress Ink, I also added some small flowers with a mini Pearl into their centres. My floral arrangement was positioned onto my card with leaves which were inked at the edges and a few flourishes for added detail. I finished with a small double layered heart chain, some dried flowers and a little thread positioned through my bouquet. 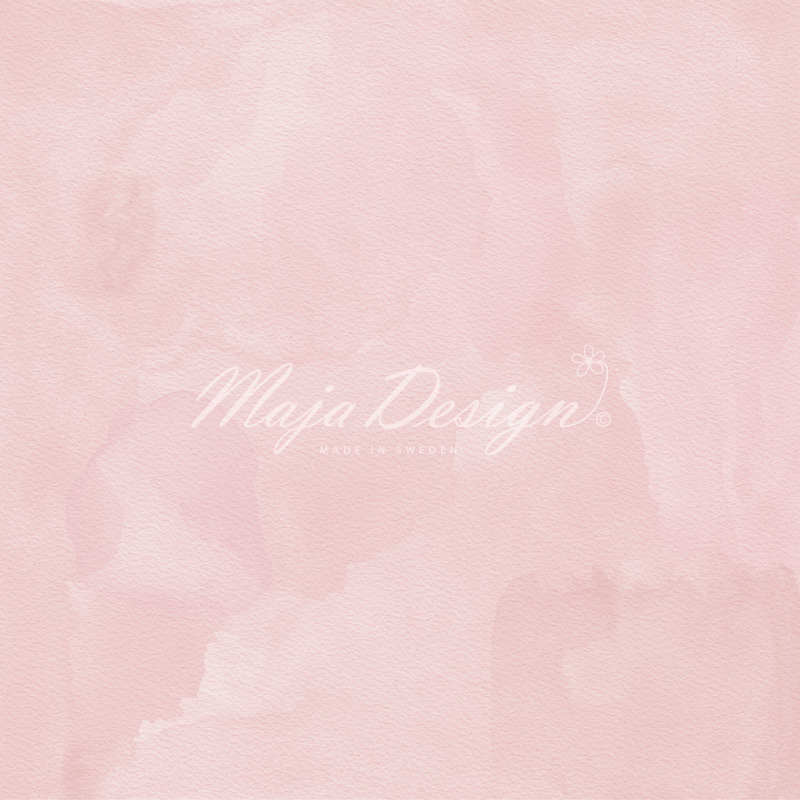 Thanks so much to Camilla for giving me this opportunity which shall be forever in my heart and for the super talented Design Team at Maja for their endless inspiration. Hi!! 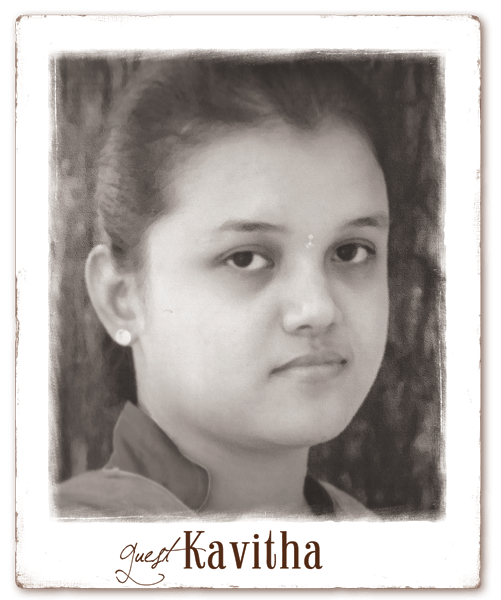 I am Kavitha from India. I have been into some form of arts & crafts all the time, but when I found mixed media 3 years I was completely hooked up. 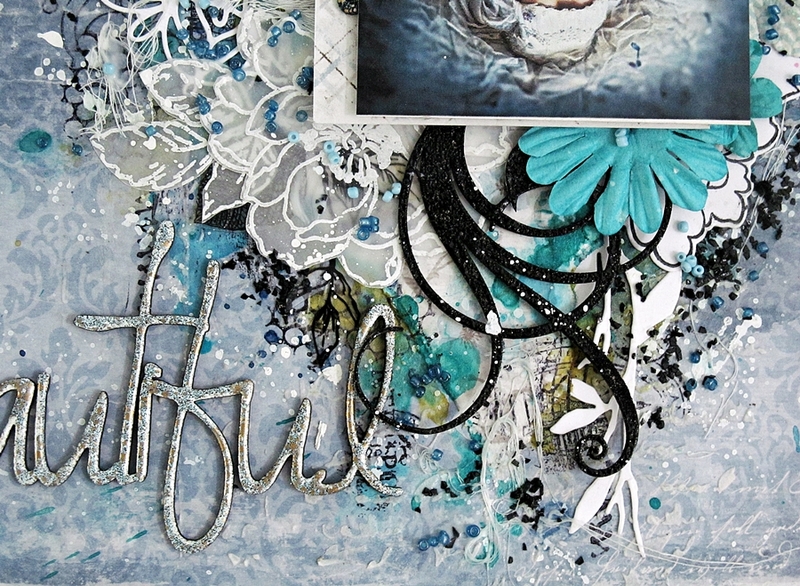 Mixed media give me lots of creative freedom and allows me to experiment with different mediums and materials. I love playing with paper, colors and all pretty stuffs. 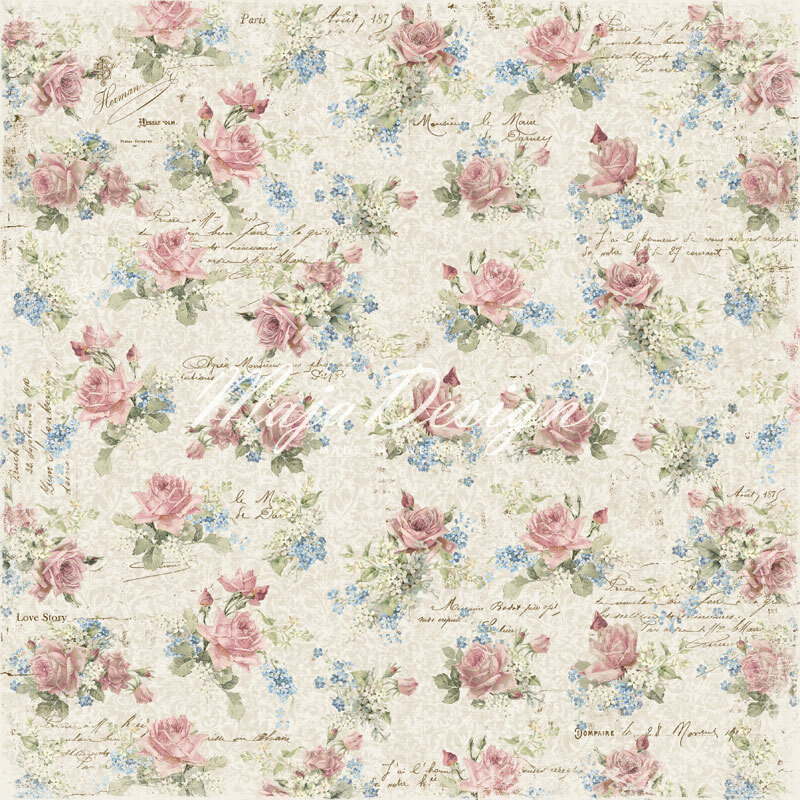 My style is more of vintage/shabby chic with lots of layers and textures but I love to try anything in between. Apart from crafting I love music, sleep, shopping and long drives. 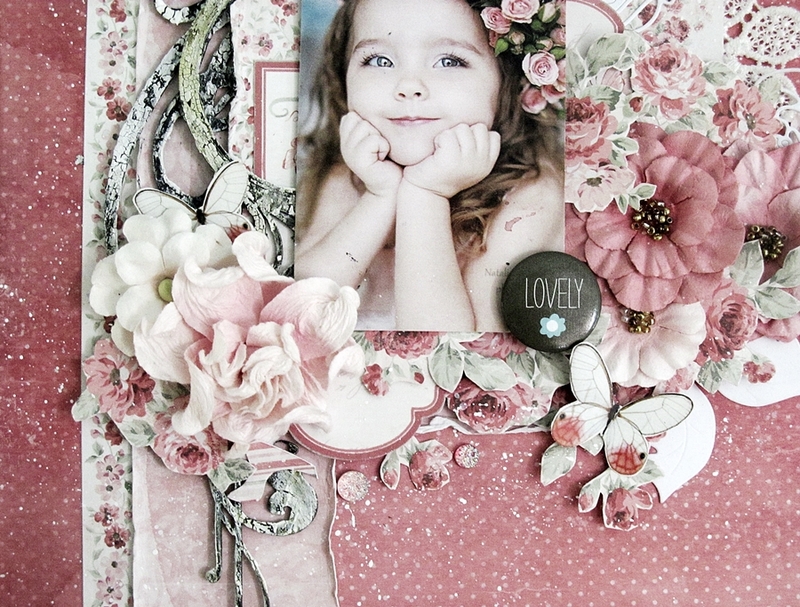 For my first layout i made a very soft, pretty and girly page with lots of layers and fussy cut elements. I have used papers from “Summer time” and “Summer crush”. Keeping the paper “He gives her flowers” as the base i used “Light scarlet” paper from summer time, torn and distressed the edges and glued both together. 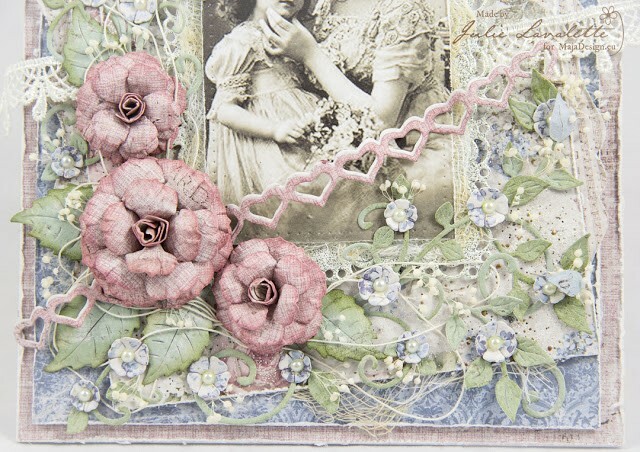 For layering i have used diecuts and papers from Summertime (In the garden, flowers everywhere and garden bouquet). 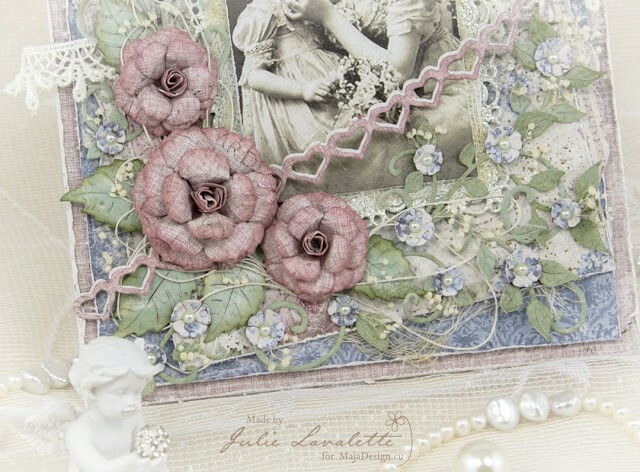 For embellishing i have used prima flowers, laces and fussy cut flowers from “Smell the roses” paper. 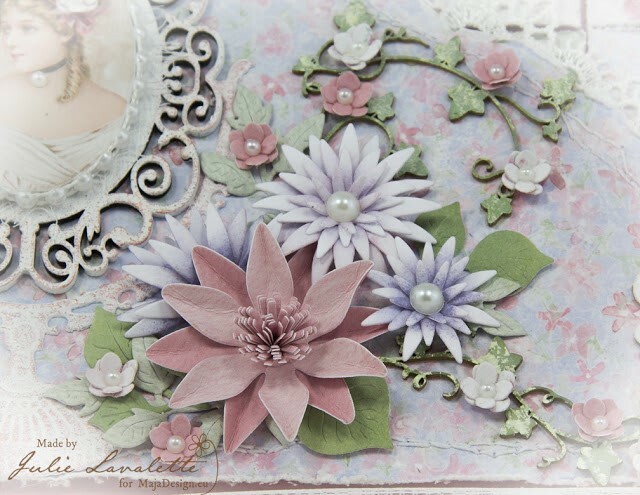 I have also used chipboard pieces from 2crafty which i colored with color bloom spray and applies ranger crackle paste on top to add some texture. 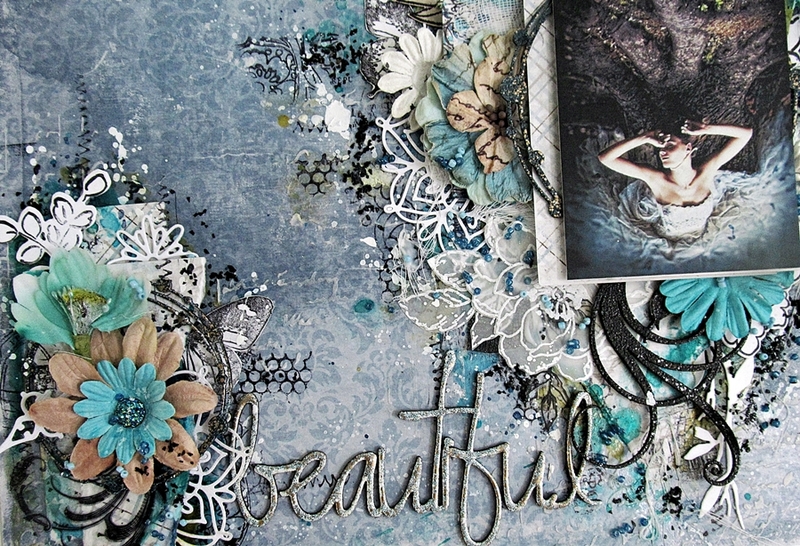 My second layout is a mixed media page with lots of layers and textures. 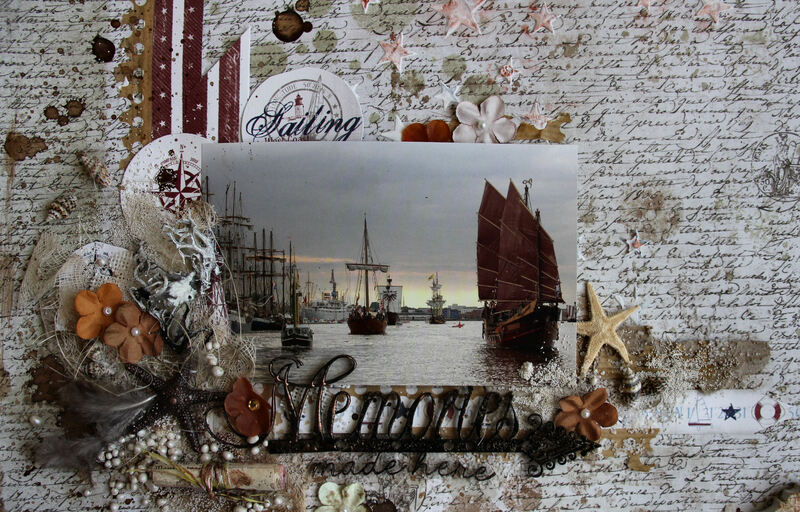 I have used “Summertime” (by the sea) glittering water” paper for my base and “Vintage romance together forever” paper for layering. 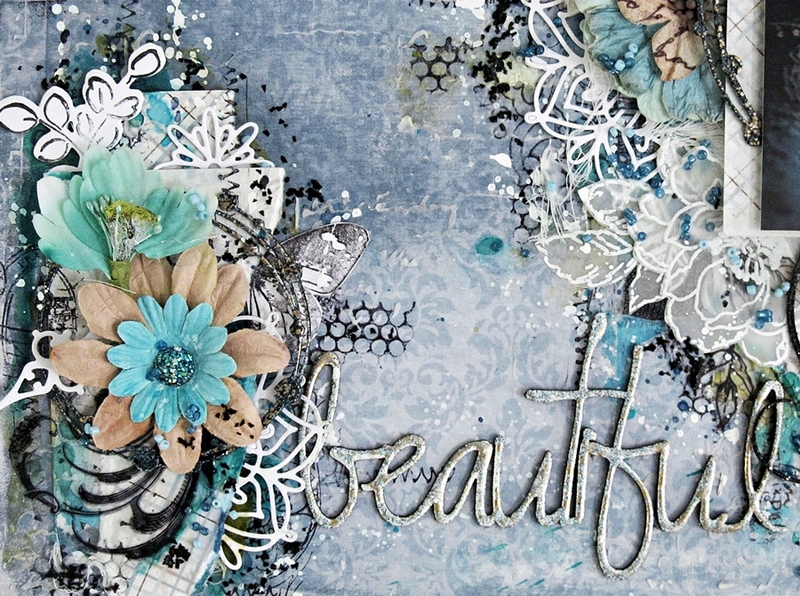 To create my mixed media background, I did a lot of texture stamping, applied some modelling paste through stencils and colored with “Lindy stamp gang” sprays in different shades of blues. 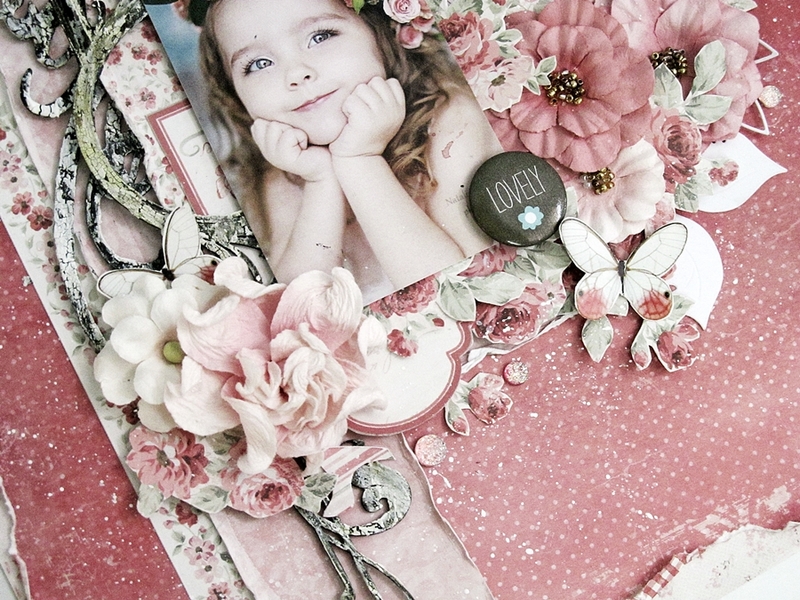 For layering and embellishing i used die uts, stamped images, prima & petaloo flowers along with 2crafty chipboards. My name is Eulanda Silvey and I will guest here at Maja today. My husband and I own our own business but we are lucky to have our weekends to ourselves. This is where I find myself heading to my craft room when there isn’t other things we need to be doing. We built a house recently and my craft room is only a set of french doors away from his man den. I set it up this way so that I can open the doors and feel like I am spending a bit of time with him while he’s in his room watching tv and I’m in my room creating. Clever huh? LOL!!! I’ve been crafting for about 10 years now and just love this hobby. If I could play full time, I would!! 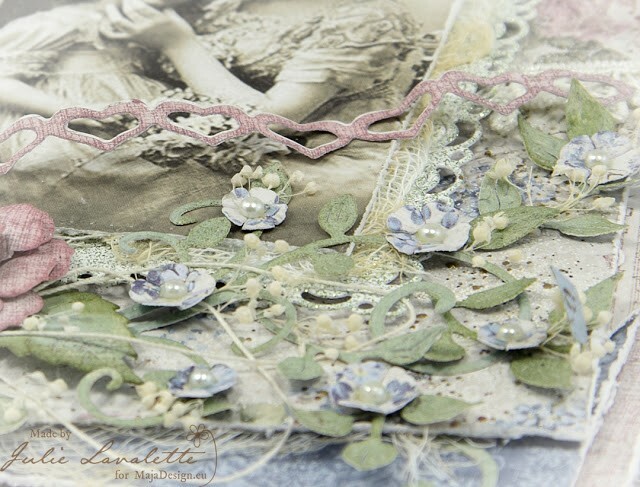 I tried to keep this card from being covered in embellishments to show the gorgeous papers from the “Coffee in the Arbor” collection. 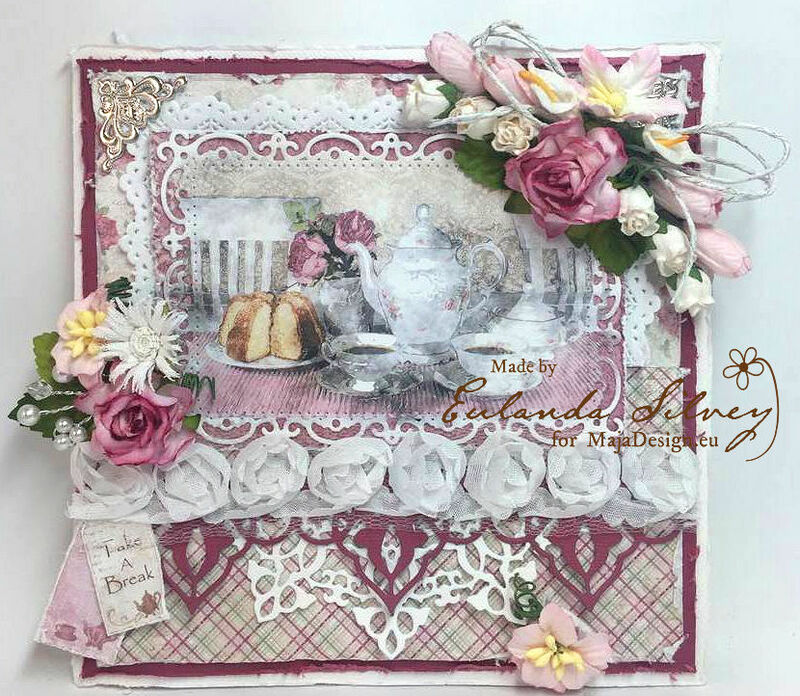 The image is from the “Delicious Moments” 12″ x 12″ and my bottom layers of the card are “Raspberries” and “Rose Garden” but from the 6″ x 6″ pad. 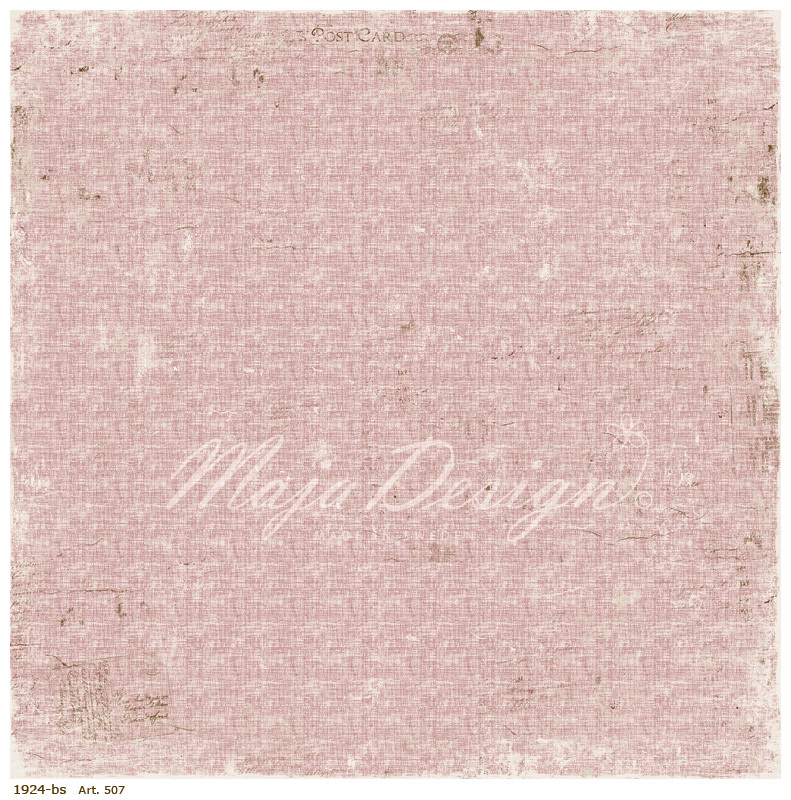 Yes I have both in many Maja collections. LOL! 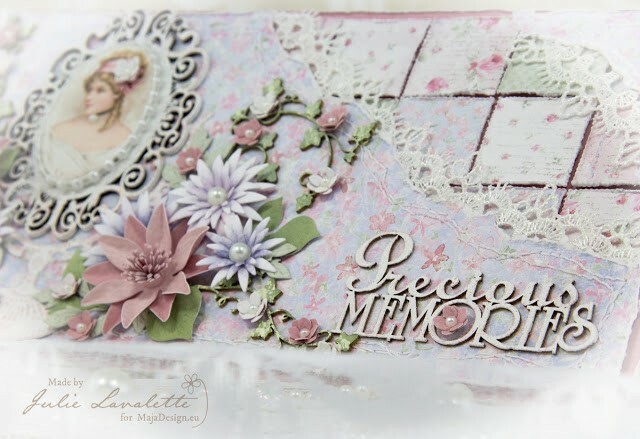 I layered with a square doily I had in my stash (well half of it) and a few more dies from Joy called “Cutting & Embossing Floral Edge Die” and “Cutting & Embossing Doily Edge Die”. 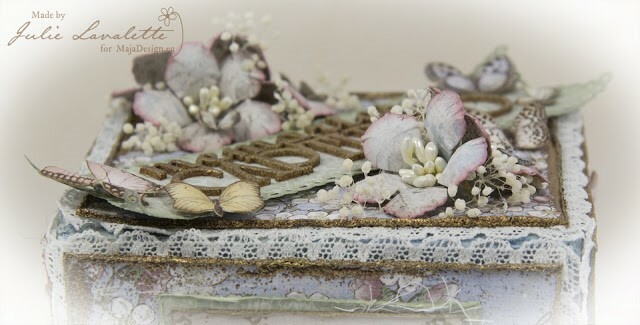 I’ve added various Wild Orchid Crafts flowers and a few leaves and finished it off with a row of white rose ribbon. Cuddle Mice This card was fun to make but after I was finished I thought I should have made it into a canvas! 7″ x 7″ (almost 18cm x 18cm) and I still managed to have embellishments fall outside of that measurement! 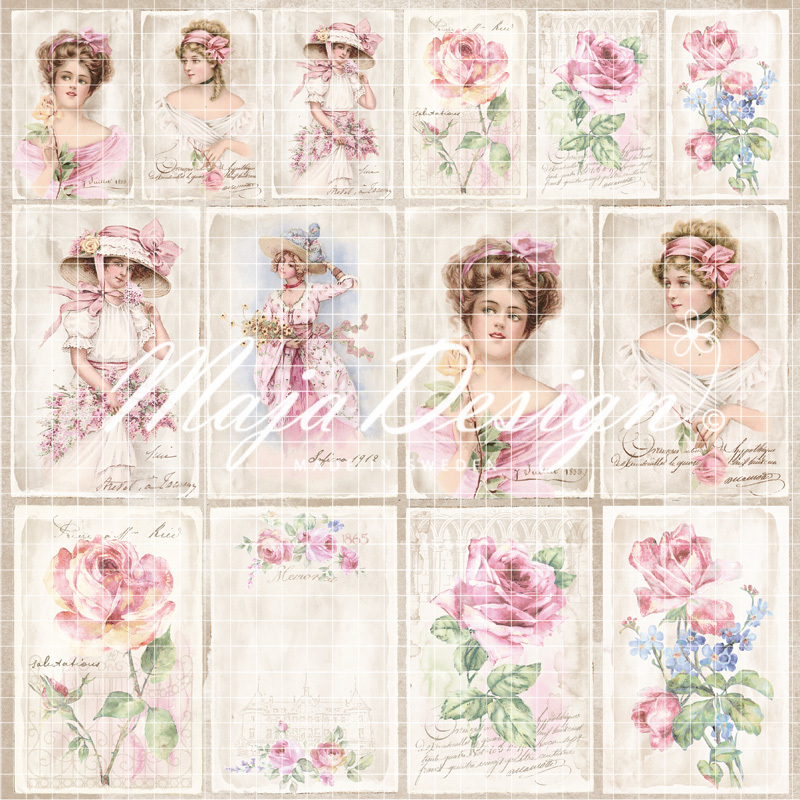 Well my thinking was that I wanted to added lots of embellishments but I also wanted to show some of Maja Design’s gorgeous “Vintage Romace” papers. Ummm….well I tried!!! LOL! 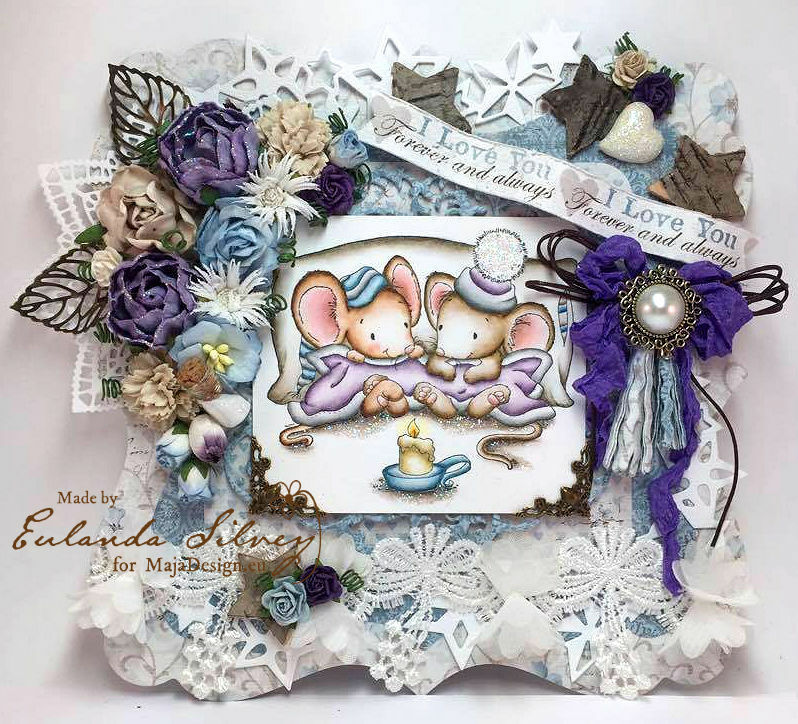 The image is from Whimsy Stamps called “Cuddle Mice”. I added some “Diamond Dust”glitter to the pom pom on the hat and over the grey flooring. FUN!!! After I added the WO English roses I put some glitter on those as well. OH and I added more to the miniature glass jar. Those are fun too! The Marianne “tassel dies” are so easy to make but adding them under the “filigree flat back pearl”, wax cord bow and seam binding bow seemed like the perfect addition. 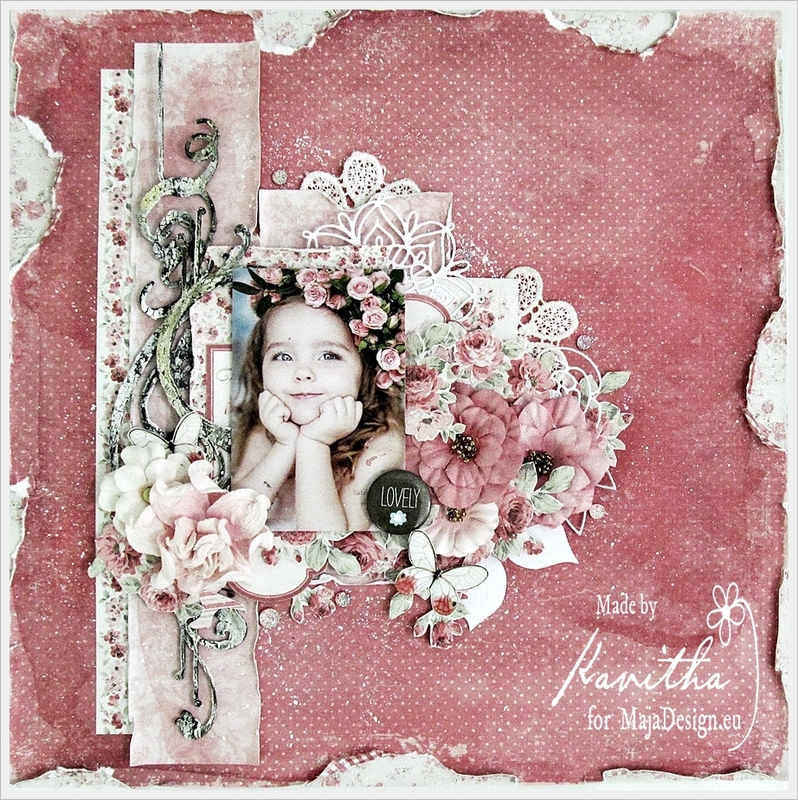 Red “Happy Summer” Card I started with Dutch Doobadoo’s Card Art A4 Tent template and layered using Maja Design’s gorgeous Summertime collection. 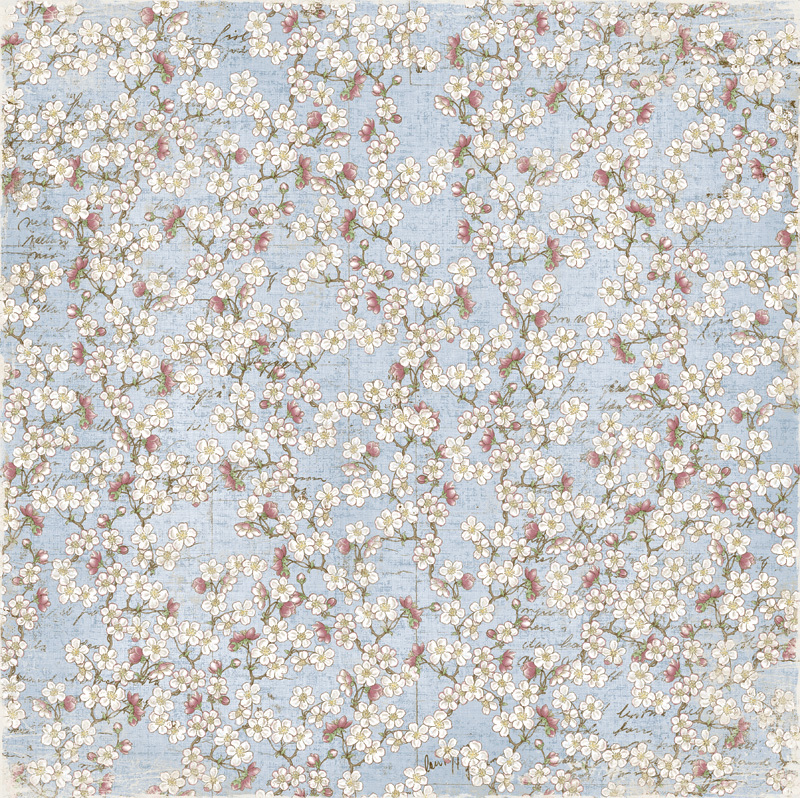 For the image I used Summertime’s “In the Garden” and layered it over Joy’s “Framework with Rounded Corners” die. For the top layer I added the “Happy Summer” strawberry stamp. I then added some Wild Orchid Craft flowers as well as a hand made Foamiran flower (white) and layered all flowers with Foamiran leaves. The shabby chic bow and rose charm were then popped on last for the finishing touch. Blue “Happy Summer” Card For this sweet card I did the same thing as the Red “Happy Summer Card” using the Art A4 Tent template from Dutch Doobadoo. I loved the Summertime collection so I thought maybe I needed two of them. 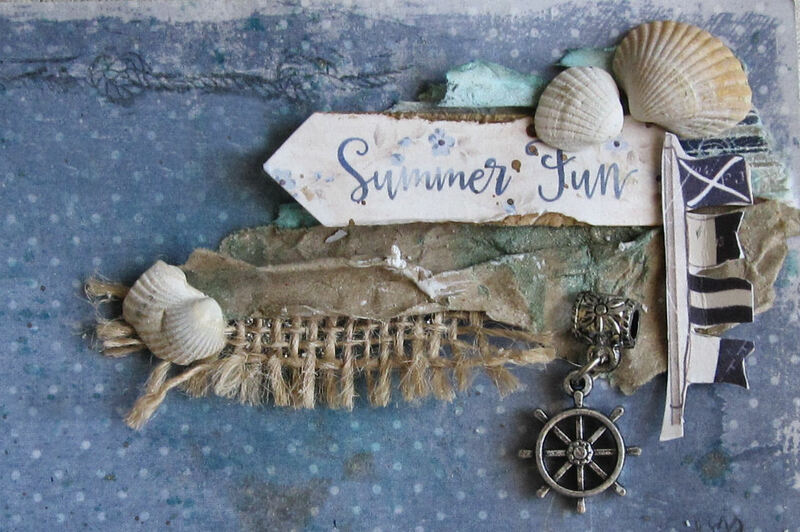 The image is from the “By the Sea” diecuts paper and same with the “Happy Summer” stamp that I layered atop the image. 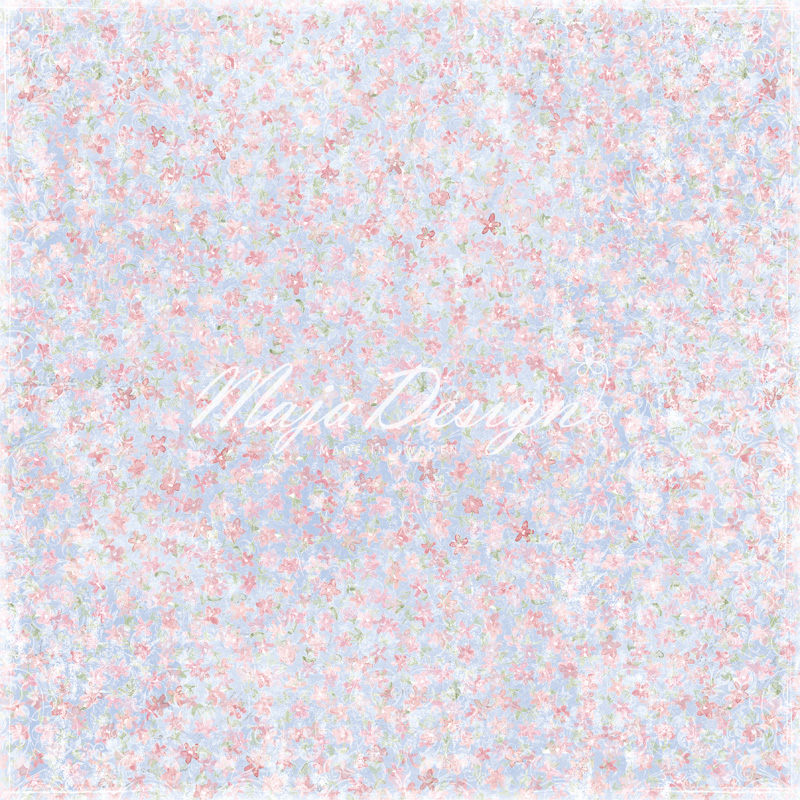 Under the image is a different Joy die called “Rectangle Frame with Circles”. Again I made a flower bouquet using more Wild Orchid Craft flowers and another cream colored Foamiran flower. I layered them with more Foamiran leaves but for this one I added a wood bark star from Noor! Design UK. 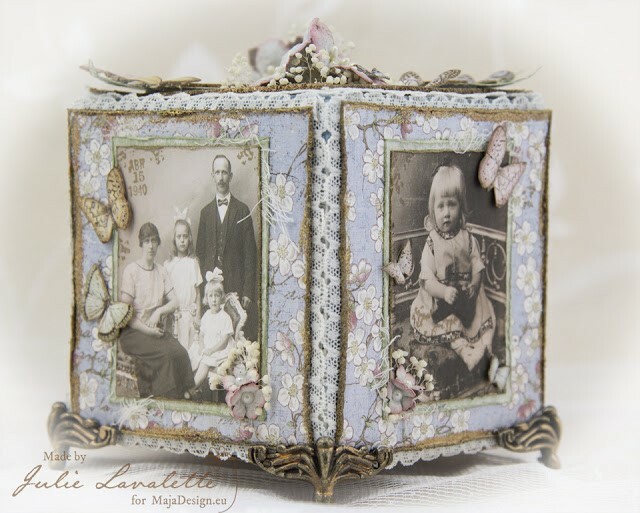 The filigree butterfly was from my stash. I hope you’ve enjoyed this one! I know I did! Monika Jakubowska with you here today. It`s nice to meet you here. Today I want to share romantic card made with Summertime collection. I used paper “Garden bouquet” and added gorgeous image from the paper “Is always the best”. Flowers comes from Wild Orchid Crafts. To make the cluster look more natural I added leaves cut out with the paper “Greenery” . I also added some chipboards from Agateria and lots of cream beads.